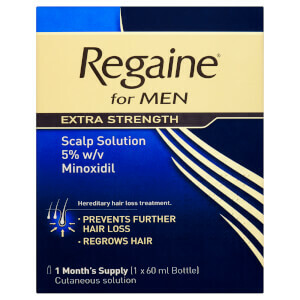 Explore the range of effective haircare designed to combat hair loss in men from Regaine here at Mankind. 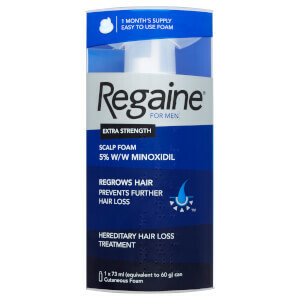 Clinically proven to prevent hair loss and even reverse the process, Regaine use an innovative ingredient called Minoxidil. 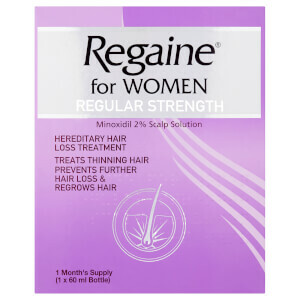 This active ingredient stimulates and prolongs hair growth, extending the follicle growth phase and sometimes re-grows lost hair. It works by helping increase blood flow in the hair follicles which in turn, increases follicular size and the hair shaft diameter. 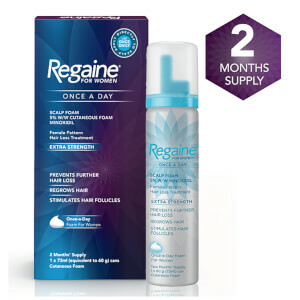 How Long Does Regaine Take to Work? The clinical studies carried out with Regaine have shown that hair regrowth can become visible from 8 weeks of continuous use. However, depending on your particular case, it can take up to 16 weeks to begin seeing results. 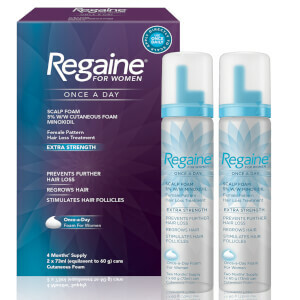 To use the Regaine solution, you should apply 1ml twice a day to dry or towel dried hair and the scalp. Use once in the morning and once in the evening, then massage the solution gently into the scalp. Just make sure to wait 12 hours’ in-between treatments and if you’re treating a larger area, opt for the pump spray over the rub-on applicator.